Driveway Repair Allows You To Repair Small Cracks and Depressions Without Breaking The Bank. Driveway repair and resurfacing makes use of a sub-base that is still intact and allows you to achieve that “new driveway” look and feel without ripping everything up and starting fresh. A sufficient base layer is the most important part of your driveway. As long as it’s strong enough, we can make minor repairs to the surface that blend seamlessly and look great with your existing driveway. Ridge Paving Can Repair, Resurface Or Reclaim Your Existing Driveway. If surface damage is minimal, we can use cutting edge technology like infrared heating machines to make minor repairs. If the driveway truly can’t be repaired, we can reclaim the existing pavement to strengthen the base layer and make your new driveway last even longer! No matter what condition your current driveway is in, you can be sure that Ridge Paving has a solution. Driveway Reclaiming Uses Existing Materials To Strengthen The Base For A New Driveway. Not every driveway can be repaired. Alligator cracking, high crown or settling in your existing asphalt are usually indications of insufficient “sub-base” material below. Our experts can assess the condition of your sub-base to determine whether or not a surface repair is the safest and most effective option. 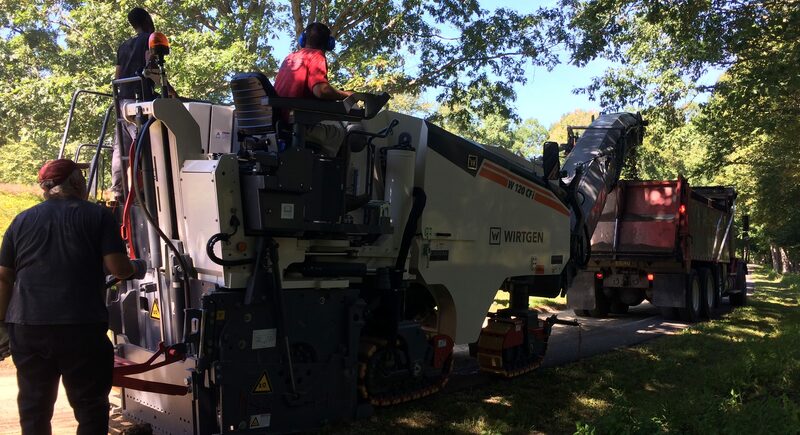 If the driveway can’t be repaired, our special equipment will break down the existing materials and use them to strengthen the sub-base and give your new driveway even more longevity. Benefit From More Than 60 Years Of Driveway Paving Experience. We’ve been repairing driveways for over 60 years in Westchester and Fairfield Counties. From sinkholes to settling cracks, sloped driveways to water damage – we’ve seen it all. If your driveway can be repaired, we’re the team with the tools and experience to do it! Ready To Get Started With A Free Driveway Repair Estimate? Since 1956 Ridge Paving has provided top-quality paving services throughout Westchester & Fairfield. We specialize in decorative Oil & Stone finishes and have experience with all aspects of asphalt paving including driveways, roadways, parking lots & paths.